Lock in a great price for Hotel Le Belvedere – rated 8.1 by recent guests! Great location, very central to the old city and easy walk from the train station. Decent breakfast included in price. No lift though so be prepared to carry your bag up winding stairs. Man at reception was nice enough to carry mine! Reason to stay at Belvedere is location. 7 minute easy walk to & from train station. Adjacent to old city center. For a two star hotel we were very comfortable and enjoyed our stay. Loved the location - within walking distance to everything including the coliseum, Roman ruins, restaurants and bars. Not far from train station and Arena. Many restaurants around it. Breakfast is included. Great location, easy walk to/from center, car rental, train station. Room was small but comfortable, excellent AC and wifi. No minibar. Breakfast was fine. Request a room with balcony overlooking the square. Nice hotel on a square in old town Arles. Location to sites is excellent and easy walking to all attractions. Nice European breakfast with better than usual selection. AC in room worked great. WIFI good. No elevator, but really enjoyable stay. Great location. Very nice bathroom sink. Good basic and clean room in Centre of town. Great location, very clean, and goes that little bit extra in the room, hair dryer, tea making facilities. We highly recommend a stay here to anyone. One of our top picks in Arles.Le Belvédère is located on a lively square in the old town, near the Rhône River. This hotel offers modern rooms featuring flat-screen TVs and free Wi-Fi internet access. You can enjoy breakfast and hot drinks throughout the day in the hotel’s bright and stylish breakfast room. 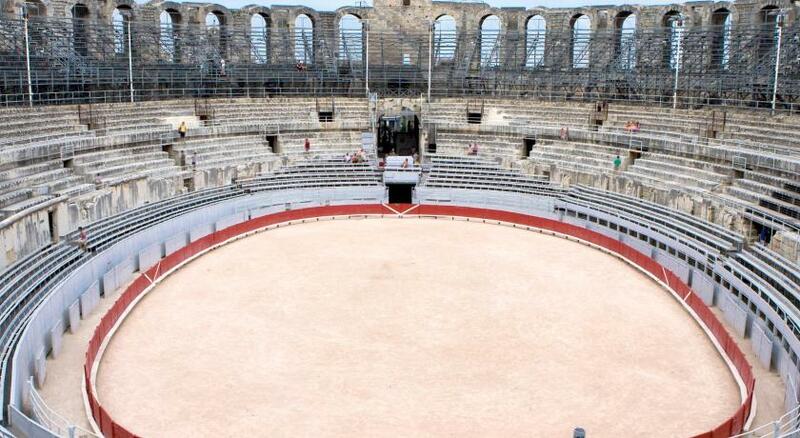 Hôtel Le Belvédère makes a great base for discovering the many UNESCO World Heritage Sites found in Arles, such as the Roman amphitheater and the Church of Saint Trophime. Public parking is available nearby for an additional charge. When would you like to stay at Hotel Le Belvedere? Free Wi-Fi and a flat-screen TV are provided in the rooms. An extra bed is available in this room. Please contact the hotel using the details found in the booking confirmation. House Rules Hotel Le Belvedere takes special requests – add in the next step! Hotel Le Belvedere accepts these cards and reserves the right to temporarily hold an amount prior to arrival. If you plan to arrive after 21:00, please contact the hotel in advance. The hotel phone numbers are located on your booking confirmation form. Please note that rooms are not serviced by a elevator. I loved the view to the square, the room is convenient and clean, the staff is very nice. Good value breakfast. close to Arles arena and Van Gogh walking area. Ten minute walk from the train station and 10 minute walk to tourists office. No parking, although they state that they have it. The closest public parking is 500m uphill. No elevator, I had to climb 3 flights of a winding and narrow staircase. The shower box is small, half open and the shower head of the low type. Poor breakfast offering. Uncomfortable bed. Tiny room. No lift - also no light-switch at top of stairs: once the fire-door has closed you are left to descend in the dark! The area is accessible to residents' vehicles only - it is necessary to park several streets away in metered bays. There are three different pricing levels within a short walk of each other - look for the green flashed meters! Facilities fair, bathroom clean but shower really small. The lights in the room. The location of the hotel is perfect. Also, I loved the fact that they offered tea, water and other small things in the room. Close to bus, train, city icons. the location is very beautiful: a small square very close to the very center of the town. loved having breakfast on a small table looking to the square outside. very close to the river and old town, some restaurants. breakfast is lovely. No shampoo or shower gel though a soap can do. The room and bathroom were very clean and equipped with what is necessary. The bed was spacious for a single traveller and very comfortable. Decent continental breakfast was provided. The location was excellent to visit tourist destinations as well as get access to the station.